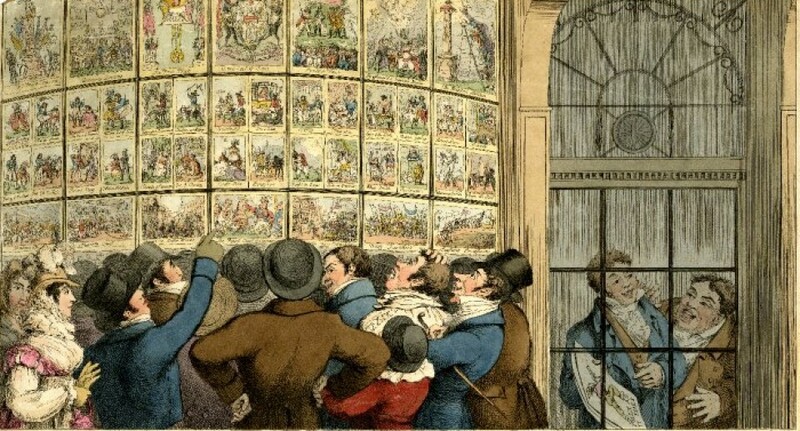 The parable of the prodigal son was a recurring theme in moralising English prints of the mid-to-late eighteenth-century. Robert Sayer and Carington Bowles both published expensive six-plate edition of The Prodigal Son during the 1760s and 1770s and the theme was taken up by the next generation of satirical printsellers, who often used it as a metaphor for the notoriously turbulent relationship between King George III and the Prince of Wales. The images on these plates were taken from Robert Sayer’s edition of The Prodigal Son, which were engraved by Richard Purcell after Sebastian Leclerc during the 1760s. David Drakard notes that Purcell’s designs were copies onto creamware teapots and jugs by the Staffordshire potter William Greatbatch, who decorated them with floral borders bright over-painting. Drakard also points out that a large quantity of unfinished English creamware was exported to Holland for enameling in this period and that presumably explains how these designs found their way onto the Continent. 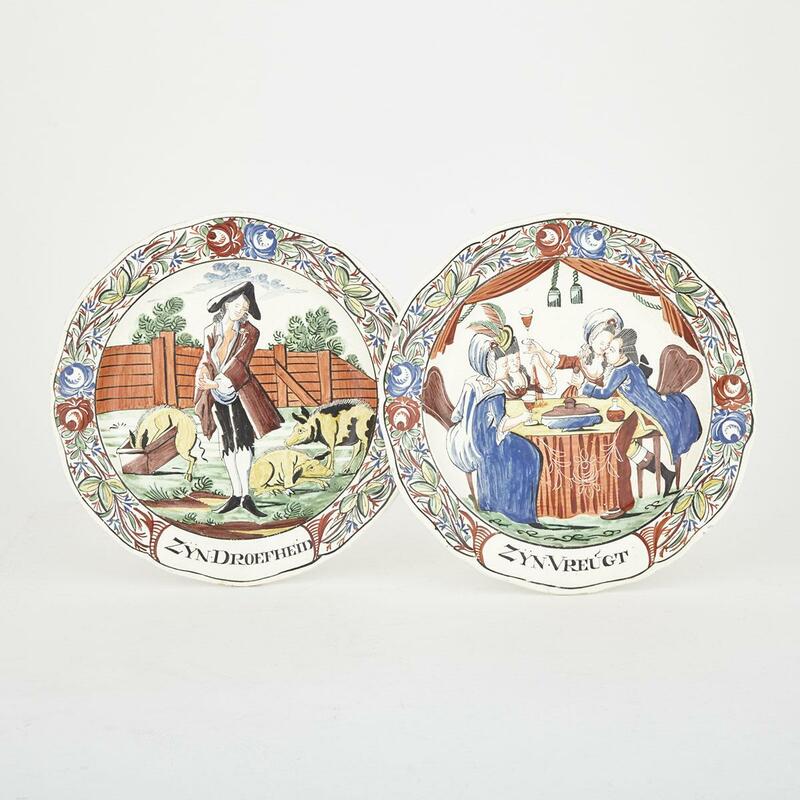 It is not clear whether these are English plates that were specifically manufactured for export, or Dutch copies of imported Staffordshireware? I suspect that they are the former, as the only significant difference between these plates and the examples of Greatbatch’s version of The Prodigal Son which appear in Drakard’s book is the Dutch text (Zyn Droefheid – “In misery” and Zyn Vreugt – “In Joy”). These plates are going under the hammer in Canada in a couple of days time with an estimate of around £130 – £180. I’ve added four new prints to my ‘for sale’ section. Click on the link at the top of the page to see the sale listings. As always, new items are added at the bottom of the page so don’t forget to scroll down. 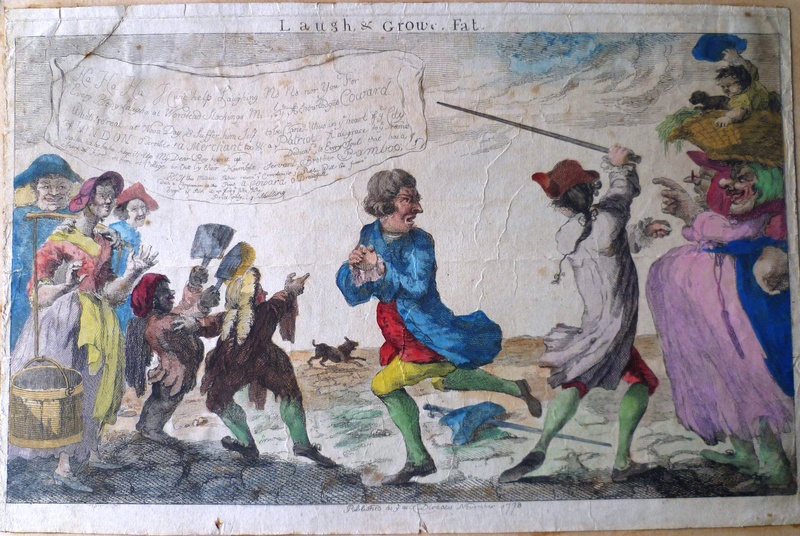 One of the items is this rather unusual satire from 1778 which, as far as I can tell, seems to have been commissioned by someone wishing to settle a dispute with an enemy. The print shows a man, whose partially obscured name appears in the text, being thrashed through the streets of London for his cowardice. The print was published anonymously and copies were sold at a shilling each, well below the going rate for an engraving such as this in the 1770s and almost certainly an indication that the publication costs had been subsidized by someone who was keen to ensure as wide a circulation as possible.